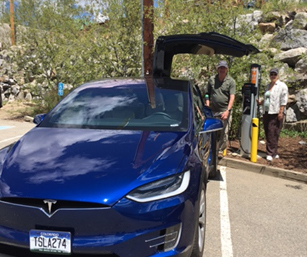 Gunnison County Electric Association and the town of Crested Butte just announced a new electric vehicle (EV) charging station in Crested Butte’s Town Plaza. The charging station represents the first public Level II (240 volt) charging station as well as the first alternative fuel station in Gunnison County. GCEA secured a Charge Ahead Colorado grant that provided the lion’s share of the station hardware cost. The town of Crested Butte provided the location. GCEA also provided labor and materials to install the station. Under the terms of the grant, the charging station is currently free of charge. With two connections at the station, EV owners may charge their vehicles up to eight hours. This allows drivers to spend the day experiencing local sights and activities while still ensuring availability of the station to all EV drivers. The EV charging station can charge all new generation electric and plug-in hybrid electric vehicles, such as the Chevy Volt, Nissan Leaf, Ford Focus Electric and more. The station is easy, reliable and safe to use.